For women business owners who want more clients, and a specific way to talk about your business that makes what you say sound clear and get noticed. You know how sometimes you talk about who you are and what you do, and it seems to fall on deaf ears? I work with you to make sure your brand is super-clear and your messaging is maximized. The benefits? You’ll know exactly how to engage potential clients and your messaging will do the work for you. You are comfortable and confident in introducing yourself and your business to anyone. You know who is ideal for you to work with – and who isn’t! You are certain that you are spending your time and money marketing to the people who need and can afford what you offer. You find new clients or customers faster and more easily than you have before. You have an edge over similar businesses because your message is strong for maximum impact. You waste a lot less time and money. You don’t worry as much about your business. You can answer questions about who you are, what you do, and your offers with total confidence and ease. It is much easier to make decisions for your business that align with your message and your products and services. It’s not as hard to design graphics, marketing materials, social media content, blog posts, or other collateral. Making “yes” or “no” decisions about your business is quick and worry free. Meeting two: Message to marketing – where to market and where NOT to bother! Bonus: Personal one-on-one half-hour consultation after our fourth meeting (you won’t feel uncertain, lost, or wonder what’s next). Included with your course at no additional cost ($125 value). If you must miss one of our meetings, no worries, you’ll be provided a recording of each of the 4 sessions. 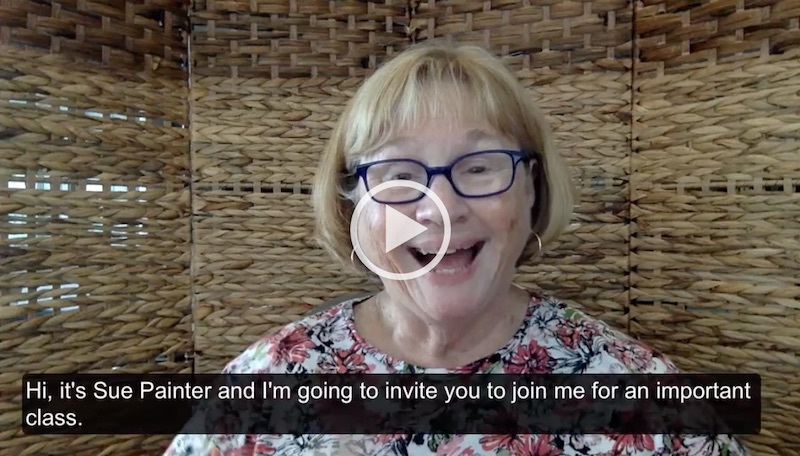 I recently had the opportunity to take Sue Painter’s Maximize Your Message course. She teaches in a simple direct way so that it’s easy to understand and she’s very patient about answering any questions we had. I finally learned during Maximize Your Message how to say what I do succinctly and quickly so the listener is able to ‘get it’ immediately. I’ve listened to many webinars and taken many courses, even about this topic but Sue Painter made it so simple and she gave us many tips to make it much easier. This is without doubt the best course I’ve ever taken on this topic. I encourage you to find out when Sue is giving this again. I just completed Sue Painter’s Maximize Your Message Training. Wow! I found clarity and confidence to introduce myself as succinctly as possible and clearly share what I do in just a few sentences. Before the class, I kept stumbling over my words and my message and people lost interest quickly without really hearing about what I do. Now, I have the right words and message and can articulate it quickly and clearly so people who are interested in what I do will hear me. In this class, I was able to identify my ideal clients, explore their needs and find my unique message, what I offer and how to present that information in a succinct way. Throughout the training, I was able to clarify my brand and my “stand out message” that shows how I am unique from all of the other coaches out there. I really enjoyed the small group structure and we all were able to learn from each other. Sue’s gentle coaching style really helped me feel at ease as we practiced our “pitch” with each other each time we met. Practicing helped me gain clarity and confidence quickly. I now have clarity to identify my ideal clients, what I offer and how to clearly and quickly articulate that message as well as the right timing to invite a new client to work with me. Thank you Sue Painter! This training was a game changer for me! It was fantastic, and Sue really helped me sort out and focus on the group I want to and should be serving. She also helped me fine tune my message, and Sue’s expert advice helped me understand how to talk to and connect with my potential clients on an emotional level. Sue gave me suggestions and helped me craft a succinct message to effectively communicate the value I have to offer my prospects. Sue truly is a confident marketer, and she helps you develop as a confident marketer. She is a branding expert, and helped me understand that in my field of health and wellness, it’s all about the transformation and the value of the transformation. I highly recommend taking this course! Next dates for Maximize Your Message Small Group (limited to 8 participants so that you get plenty of individual attention). Register now to reserve your space for June, so that your seat is guaranteed. We’ll meet in my virtual meeting room using ZOOM so there will be lots of interaction, the ability to share screens, and live Q&A. For this reason, please attend live! You’ll also receive a PDF of Sue’s Powerpoint presentation and a recording of each meeting, so that you can always refer back if you want.